Sign language is the language used to communicate with deaf people (people who can’t hear or hear just partially). World Health Organisation (WHO) says around 466 million people worldwide are living with hearing impairment, and 34 million of these are children. There would be an extreme global burden if this great number of people is not involved in daily work just because they can’t hear and no one is able to communicate with them. Unaddressed hearing loss poses an annual global cost of US$ 750 billion. This includes health sector costs (excluding the cost of hearing devices), costs of educational support, loss of productivity, and societal costs. 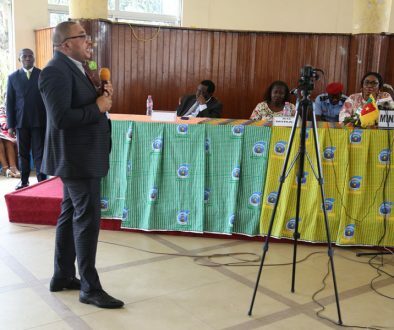 Manasseh Che, Head Teacher of Cameroon Baptist Convention (CBC) Inclusive School and Sign Language Center (ISSLC), says the Institution spends close to FCFA 45million every year to educate children with hearing impairment and train sign language teachers. The event presented the opportunity for the CBC Inclusive School and Sign Language Center in Mbingo-Cameroon to reflect on the road it has covered this far. The school started in the year 2000 and today teaches about 156 children with hearing impairment. 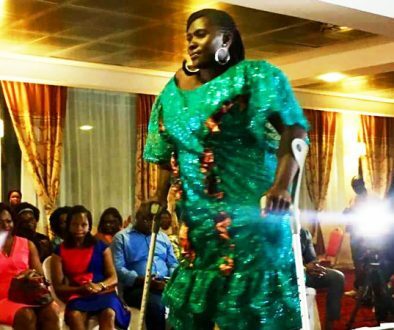 Glory Ndzi has been deaf since birth. She is an alumnus of CBC ISSLC, and also a sign language teacher in the school. Through a hand written note, she tells me how she copes in the community especially in church without an interpreter. “I always try to sit beside someone who can be patient to write down for me what is said. The day I sit beside someone who can’t write, I leave the meeting with almost nothing,” says Glory. “I am always lost with TV and radio when there is no interpreter. There are hardly sign language interpreters on TV because our people still don’t include deaf people. “When music is playing, I try to follow the vibrations I get from my feet and follow how slow and fast I see people move in dancing. Sometimes even with an interpreter, music is still difficult to grasp when the interpreter doesn’t understand the language used,” writes Glory who is visibly worried about her ordeals. “There can be an interpreter, but it is easier when he or she is experienced and understands other languages,” she adds. Mr Che Manasseh, who is the Head Teacher of CBC ISSLC and personal interpreter to Glory, says Cameroon still does not have a sign language system. “We use the American Sign Language combined with locally developed signs. 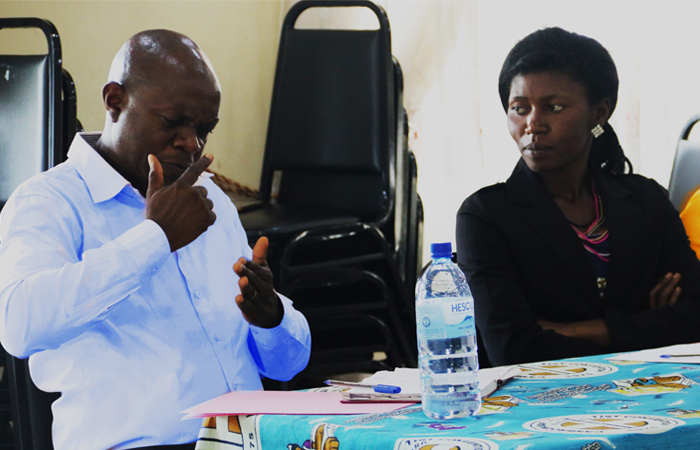 Glory (Right) always seats besides her interpreter Mr Che Manasseh (Left) during important meetings. “We tried to create a single sign language system for Cameroon some time ago, but it failed because of the bilingual nature of the country. 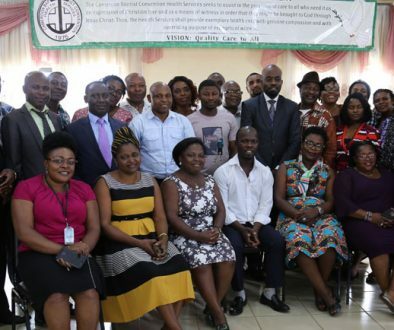 We need to create two (English and French) sign language systems because there are some differences that usually cause problems for children and trainees,” explains Manasseh. There are very few sign language teachers in Cameroon. This makes it difficult to spot experienced and professional interpreters, yet a good sign language teacher in the country earns less than $250 a month after going through seven years of training. Mr. Che who has been an interpreter for close to 15 years affirms that most of the few sign language trainers and interpreters in Cameroon are driven by passion not the pay package. He reveals that deaf children face the problem of exclusion in their communities because people find it difficult to communicate with them. Everyone therefore, needs to learn and understand some basic sign language. “CBC ISSLC in partnership with the CBC Health Services’ Socio-Economic Empowerment of Persons with Disabilities (SEEPD) program and some local Councils in the Northwest Region have trained parents and some community members to be able to effectively communicate with these children and ensure their inclusion. “We train teachers on sign language and send them to other schools like Government Bilingual High School Bamenda, Baptist Comprehensive High School Njinikejem and many others,” says Manasseh. Ms. Ngah Ashery, SEEPD Program Community Project Officer, says the program subsidizes the cost of educating children with hearing impairment. “All the children benefit from free Ear, Nose, Throat (ENT) screening in our hospital, and hearing devices are given to those in need at low cost,” remarks Asheri. Ms. Ngah is, however, optimistic about the promising results of inclusion of persons with hearing impairment. She insists that it is necessary for everyone to be able to communicate using sign language because we meet deaf people every day.